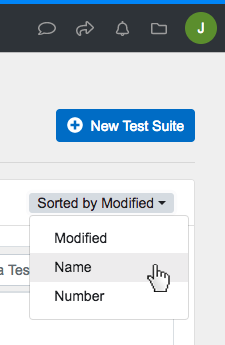 To sort your test suites, click on the drop-down menu to the top right of your ‘Existing Test Suites’ that begins with 'Sorted by…' By default, 'Sorted by Modified' will be selected. Select the method by which you wish you sort and view your test suites. For example, selecting 'Sorted by Name' will reorganize your existing test suites into alphabetical order, based on the name you assigned them during creation. 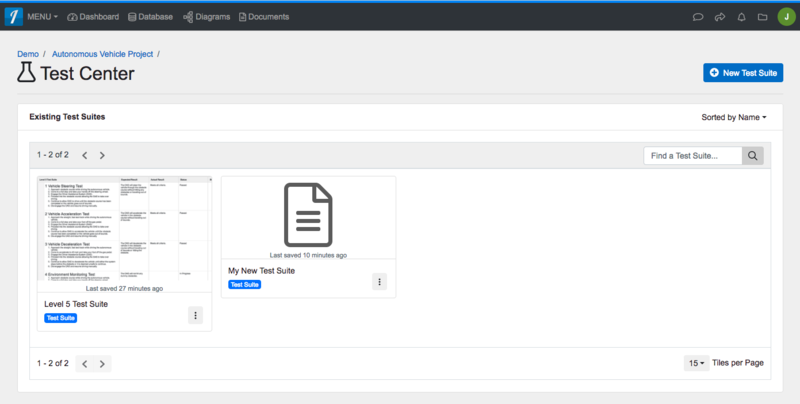 To sort your test suites, click on the drop-down menu to the top right of your ‘Existing Test Suites’ that begins with ‘Sorted by…’ By default, ‘Sorted by Modified’ will be selected. For example, selecting ‘Sorted by Name’ will reorganize your existing test suites into alphabetical order, based on the name you assigned them during creation.